Last week, I knit something. I can’t show you (yet), but I can tell you this: It’s a test knit for Chrissy Gardiner’s forthcoming book, it was fun and fast, and I think it’s an excellent pattern for people who’ve been wanting to try toe-up socks but have been a little intimidated. Okay, that’s all I’m going to say about that for today. In other Secret Knitting News, the Knit Picks sample I knit back in July appeared in the latest catalog and on the Knit Picks site. Santa is slowly materializing, right before my very eyes. I have realized that by working from the bottom up, I’m going to have a headless Santa at some point. I promise to take a picture. 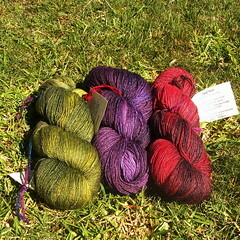 Left to right, that’s “The Deep-Bosomed Earth” (#1), “Momos” (#2), and “A Fateful Plan” (#3). The three tags with paragraphs of the story are tacked up on the corkboard in my office. Those are “Designated Driver” and “4-8-15-16-23-42”. 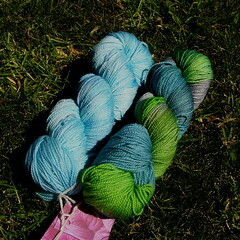 There are still a few skeins of each (and some others) available for sale, if you’d like a Yarntini fix, too. I’m pondering buying some more of the “Designated Driver” and making a shawl. If I ever get to actually knit again.